From small apartments to vast mansions, In the warm-weather months, a beautifully decorated patio can become an extension of your living space. And from picnic to wedding, it can be the perfect setting to host friendly gatherings. We often limit our thinking to the ground when we consider natural, outdoor spaces—planters, fountains, rugs, furniture, etc.—so unexpected hanging decor draws the eye and creates memorable outdoor spaces. Chimes, chandeliers, fountains, planters and string lights are just a few ways to add pizzazz and create a truly magical alfresco experience. With a little imagination, you can create a space that reflects your unique personality and style. Here are 23 ideas to take your decorating vertical. 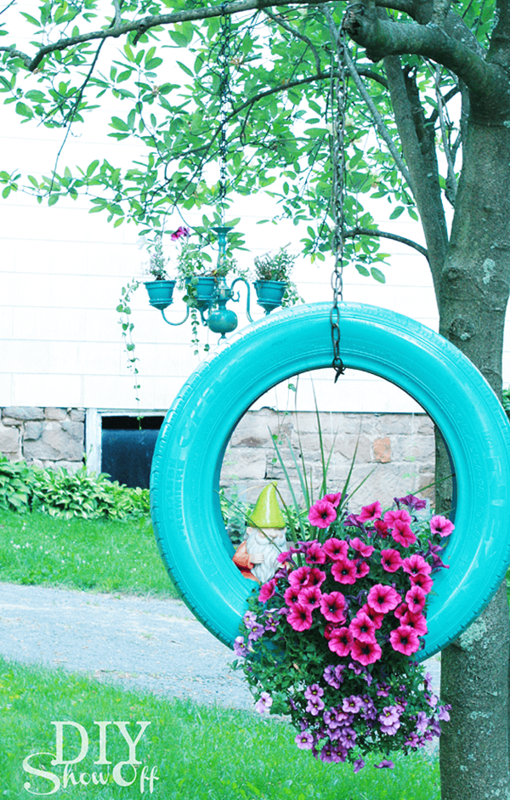 Repurpose your old set of tires as charming planters! With a can of spray paint, a chain or rope, some soil, and ornamental plants, you can turn what may have ended up trash into part of your yard’s darling landscape. Keep in mind that tire planters are not suitable for edibles—stick to flowers and foliage. So the adage goes, one man’s trash is another man’s treasure. 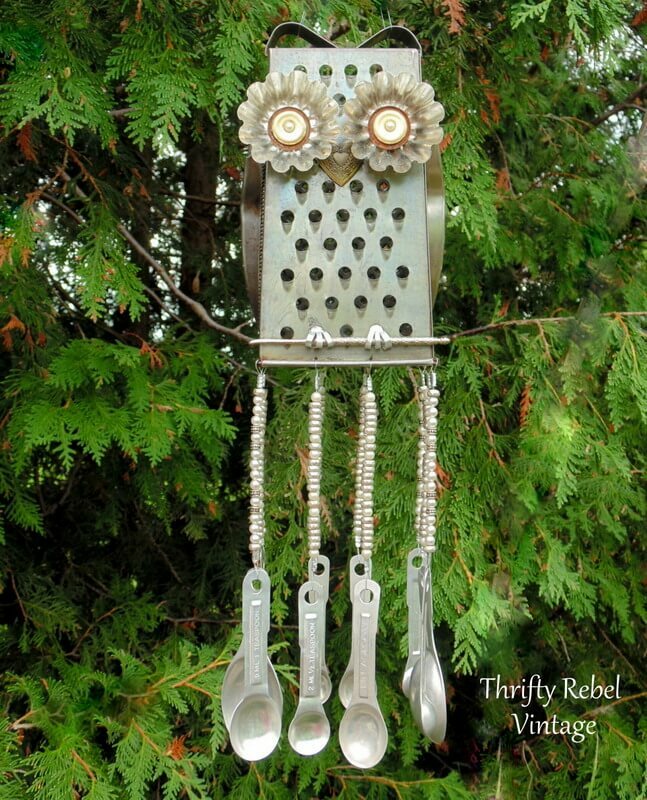 This darling owl windchime was fashioned from a cheese a grater and measuring spoons. 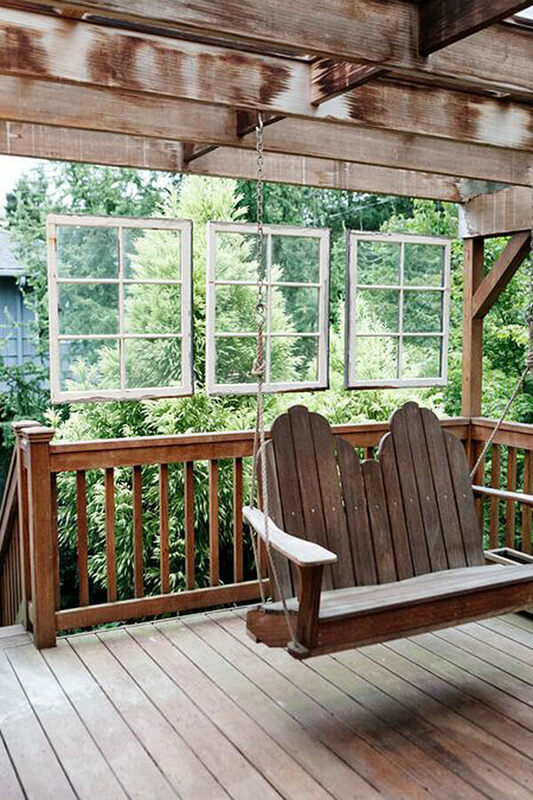 What do you have around the house to transform into a chime or another type of vintage chic decor for your outdoor space? String lights are the foundation of a truly magical alfresco experience. Just think of an outdoor space that you’ve been in and loved—were there lights? Our guess is “yes.” These Edison-style lights have a vintage look, put off a lot of light, and are heavy-duty enough to hold up for seasons to come. 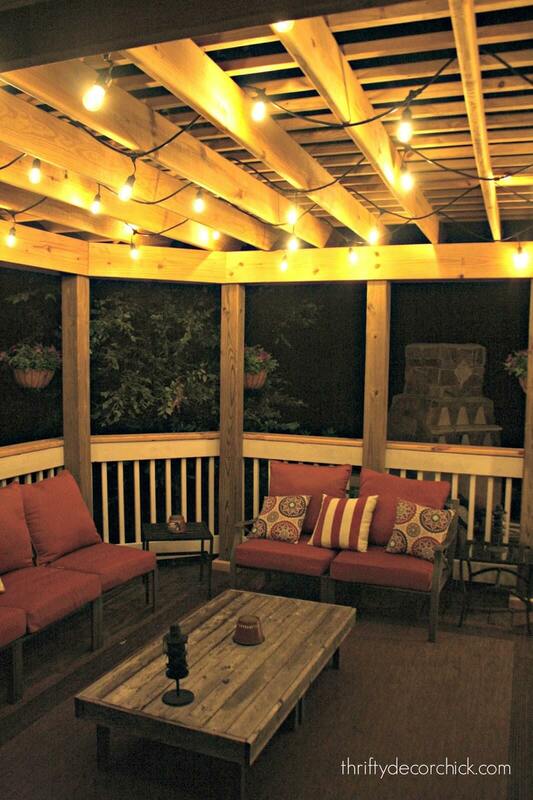 Light up your patio with just a few inexpensive items from your local dollar store. A mason jar, solar light, a handful of small stones and a shepherd’s hook create the appeal of a candle without having to break out the matches. 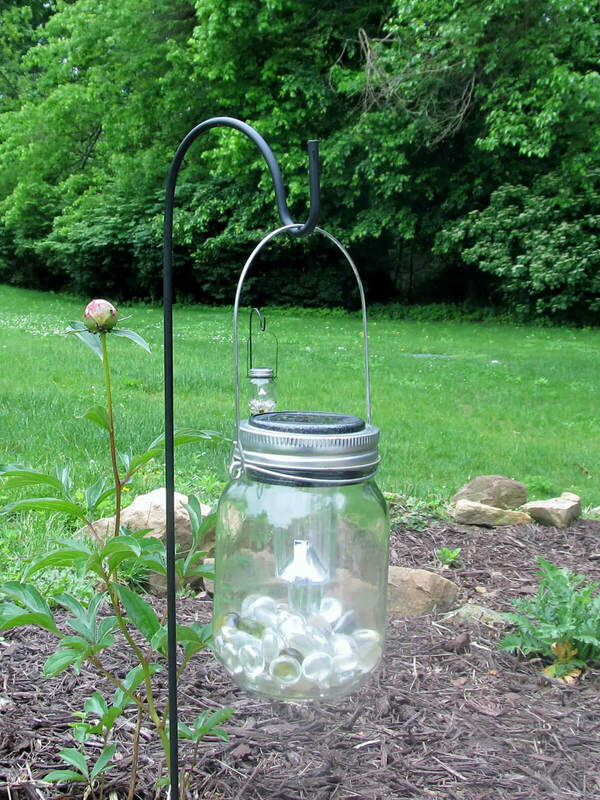 For a greater illumination, create several mason jar lanterns and line your lawn or driveway. 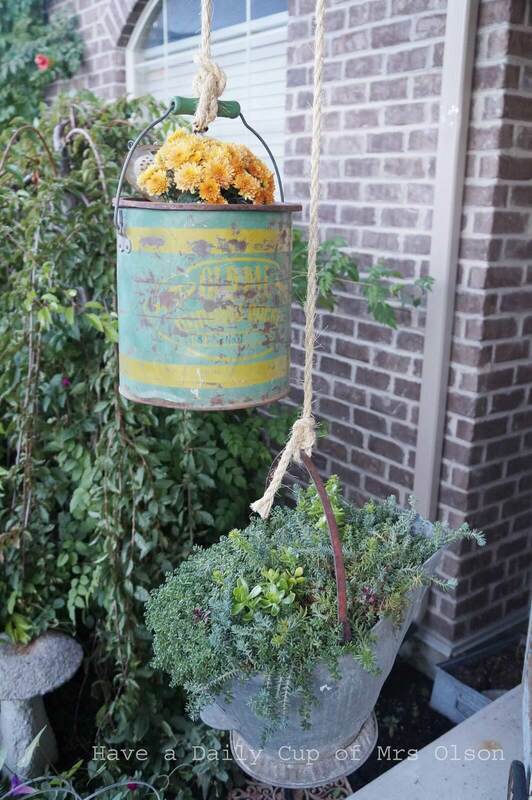 An old galvanized bucket becomes a pretty planter for flowers and foliage. These buckets are easy to find at your local flea market. 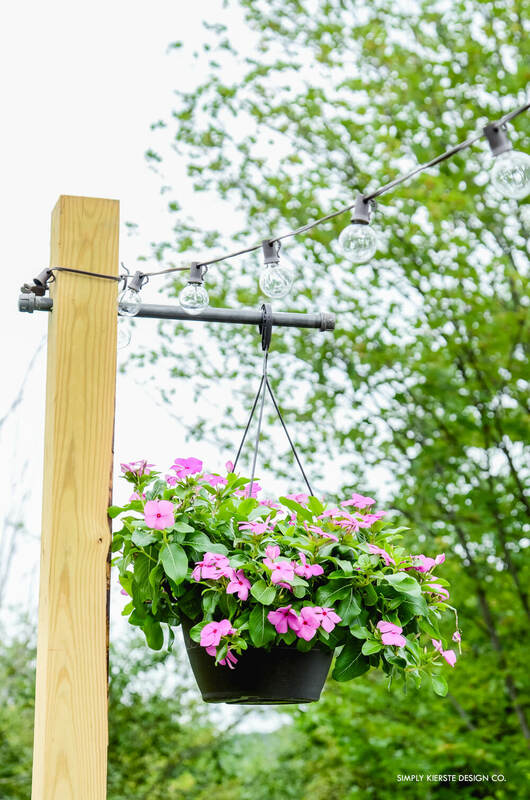 For a simpler version of this look, forgo the pulley and opt for a simple length of twine to suspend buckets by hooks around your patio or deck. 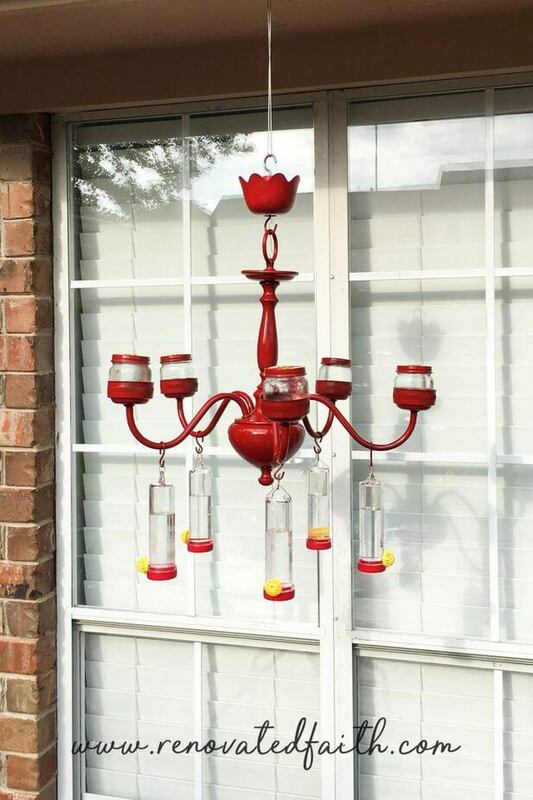 An upcycled chandelier gets a new purpose in the garden as a hummingbird feeder! Old chandeliers are abundant at thrift stores and garage sales. Find one you like, remove the light fixtures, and paint and decorate to your delight. Just add hummingbird feeders and—viola—you have a beautiful garden piece that will attract lovely little creatures to your alfresco space. 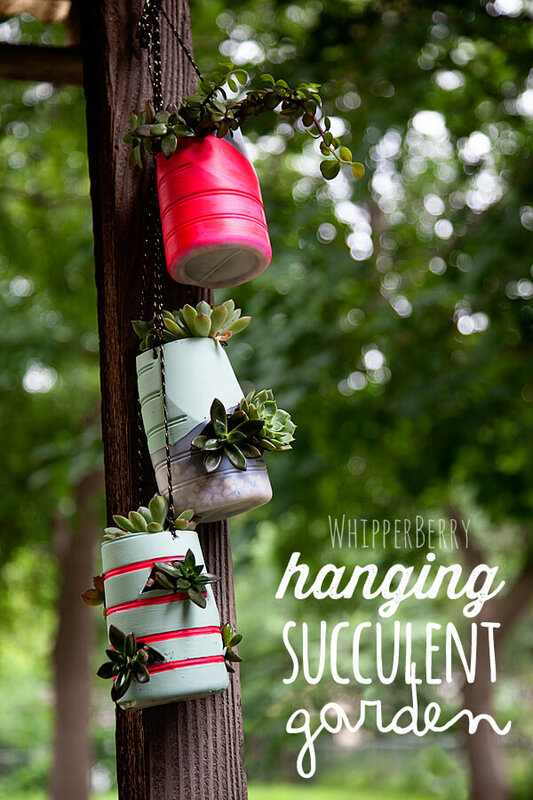 These painted tin cans strung together with clothesline are as functional as they are cute. Upcycle old soup cans with a little spray paint to make darling containers for your fresh herbs. These planters make great use of vertical space for gardenless gardeners restricted to small patios and decks. A hammer and nail will easily provide the holes for drainage and stringing together. 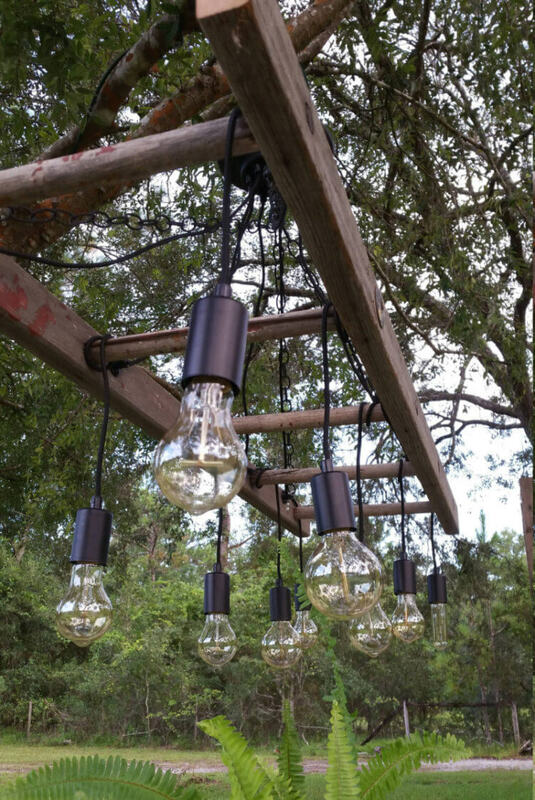 Do you long to hang string lights in your garden but lack the structure? Enter the DIY post! Pressure treated 4 x 4 posts from your local lumber yard or home improvement store are an easy addition to any garden space. Add plant brackets and planters filled with spilling plants and flowers to wow your neighbors and guests. This adorable DIY wind chime is one of the easiest, most inexpensive hanging outdoor decoration ideas to add whimsy to your garden. All you need are four small pots from the dollar or craft store, a long piece of twine, and crystal (or something else heavy and decorative for the bottom, and some acrylic paint. To achieve the ombre effect, mix a color of paint with an increasing amount of white paint for each pot. 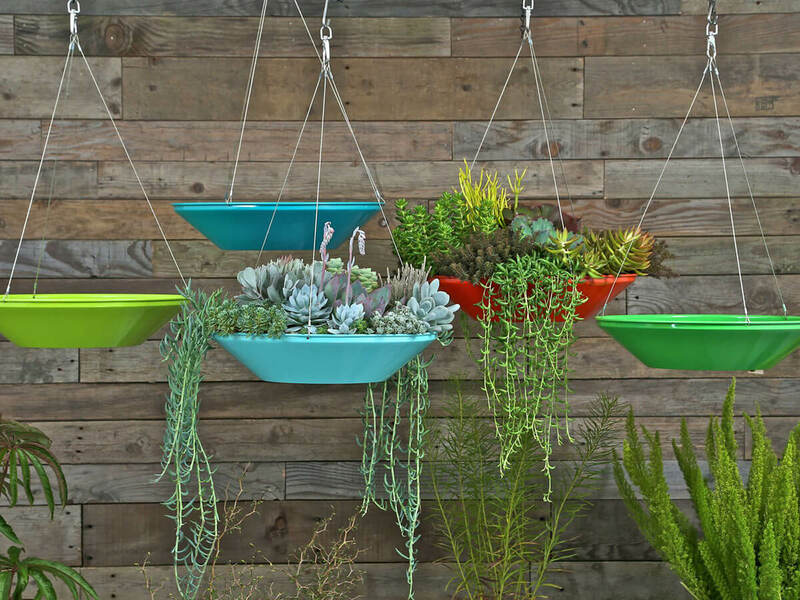 Would you rather have a rain chain then a chime, just turn the pots right side up! A coffee creamer habit comes in handy with this cute DIY project. Painted bottoms of plastic coffee creamer containers become easy planters for succulents. 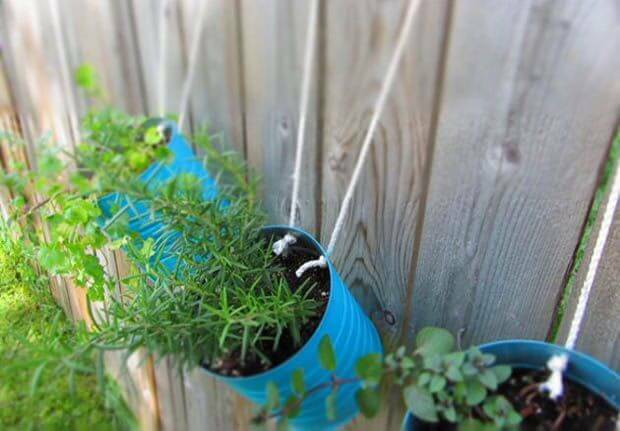 By cutting small holes in the sides of the containers, you create little homes for small plants. Add pebbles to the bottom for drainage and suspend with a chain or twine. Like a light fixture for your living room, an herb fixture for your patio! 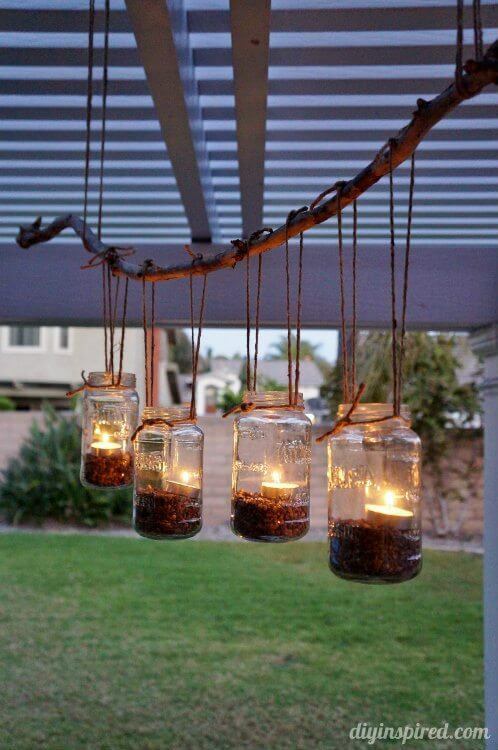 How cute would this be suspended above the table at an alfresco dinner party? All you need to make this a reality in your garden is a beam, a few galvanized pails, some twin or chains, and your herbs, of course! It may seem silly to place windows where no wall exists, but these vintage panes make the landscape pop by adding structures to view it through and around. The thin cables make the window panes appear to hover in thin air. What a cool way to add offbeat charm and set your garden apart from the neighbors’. 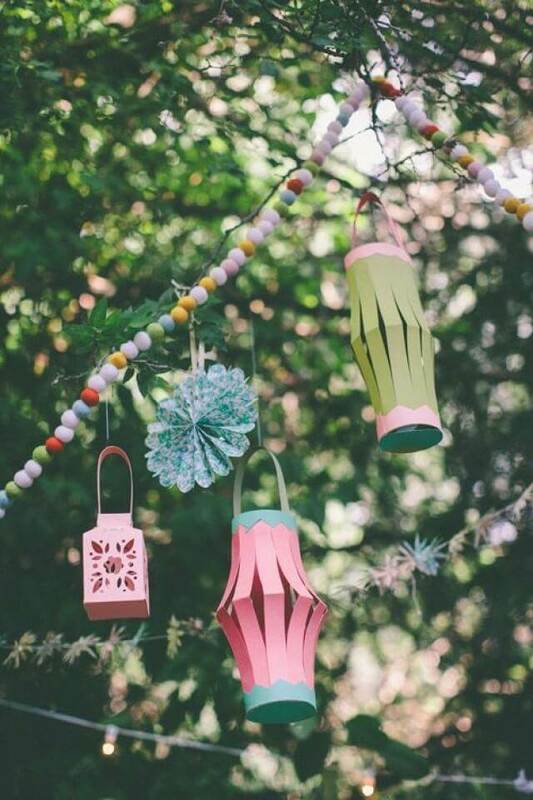 Nothing says garden party like festive paper lanterns. And, requiring minimal materials—construction paper, scissors, and glue—the sky’s the limit to how many you can make. Colorful garland will add to the gaiety and serve as the perfect way to suspend your lanterns. Get some friends together for a fun pre-garden party to make and hang this darling decor. 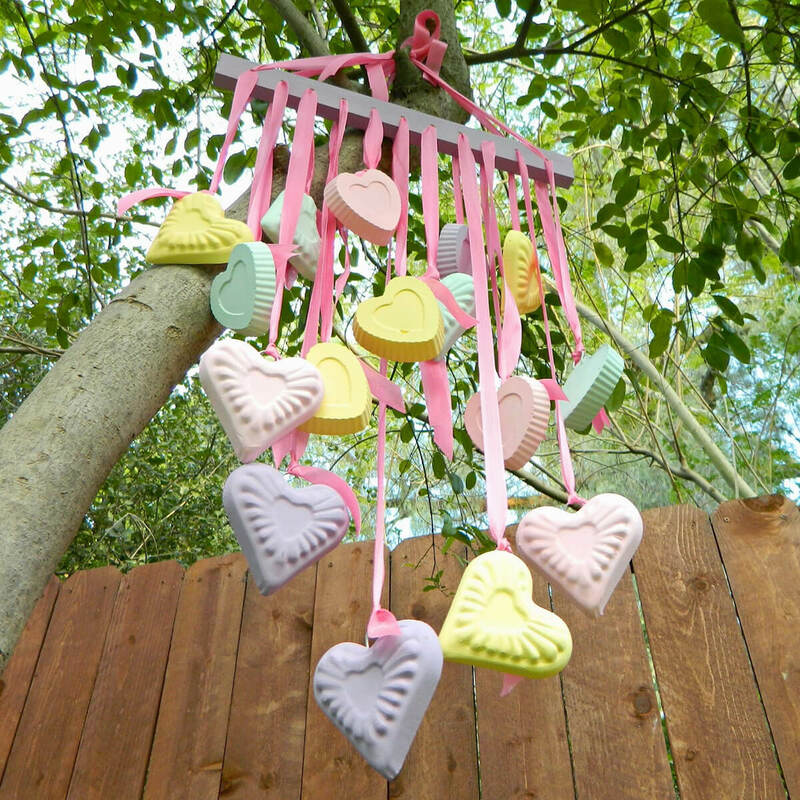 This adorable hanging decoration features candy heart ornaments, perfect for Valentine’s Day or any “sweet” occasion. Do you DIY? If so, get busy with some plaster, heart molds, chalk paint, ribbon, and a hanger to bring some sugar to your outdoor space. These hearts swaying in the wind are sure to sweeten up any alfresco affair. 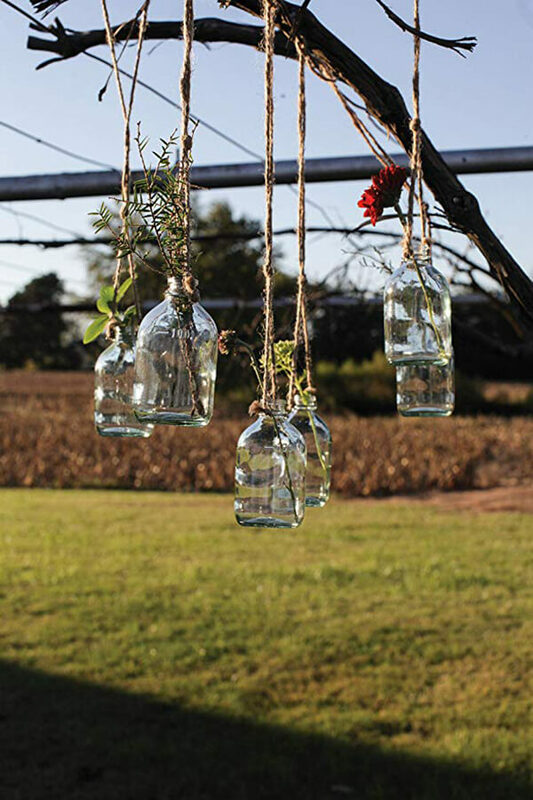 If rustic charm is the atmosphere you’re going for, this mason jar “chandelier” is the natural, inexpensive solution. This DIY project involves mason jars filled with a handful of sand or pebbles topped with tea lights, and suspended from a large stick with twine. Picture this beautiful fixture hovering above a country table filled with family and friends on your patio. Vintage style bottles are perfect decorations for your wedding, alfresco dinner, or garden party. By placing cut flowers in vases of water in the outdoors, you create a special occasion atmosphere through impermanence. And, suspending them from a tree or balcony with a little twine adds extra charm and whimsy. Long for a window box spilling with flowers and plants, but lack the window—no problem! 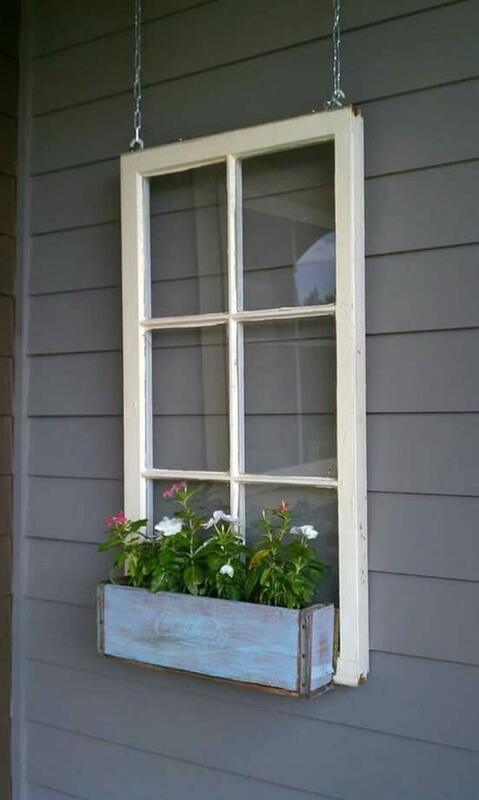 An antique, repurposed window frame can be fitted with a box, filled with plants of your choice, and placed wherever you’d like it with a rustic chic window frame flower box like this one. 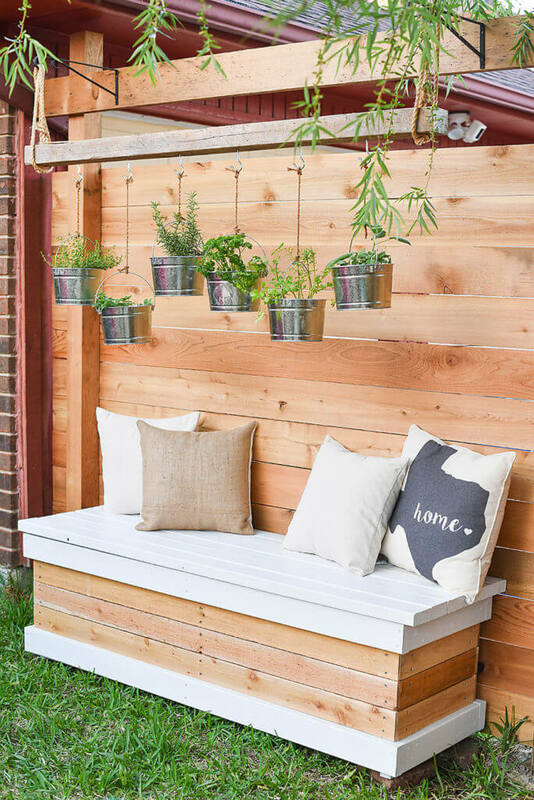 Hang it against the house, fence, or somewhere else to up the appeal of your patio space. 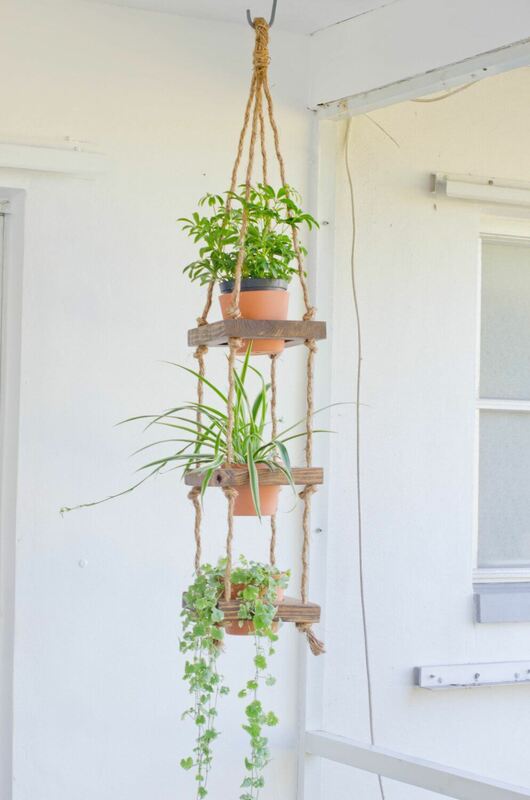 Fill up vertical space on your patio with a tiered wood and macrame hanging planter like this one. At once funky at rustic, this piece adds a creative twist to any natural space. The pots pictured here feature a thriller (tall plant) on top, a filler (lower foliage) in the middle, and a spiller (over flowering plant) on the bottom level. This colorful, glass fountain hovers in the air and doubles as a bird bath. Solar power makes it mobile, and the sound of a bubbling fountain brings peace and calm to any outdoor space. 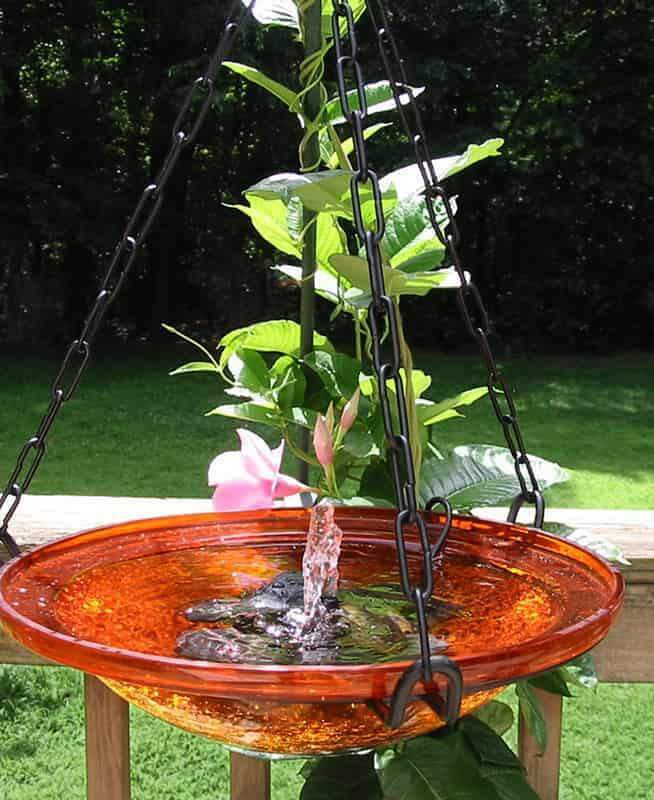 A great way to make a hot day feel cooler while attracting beautiful birds to the yard. 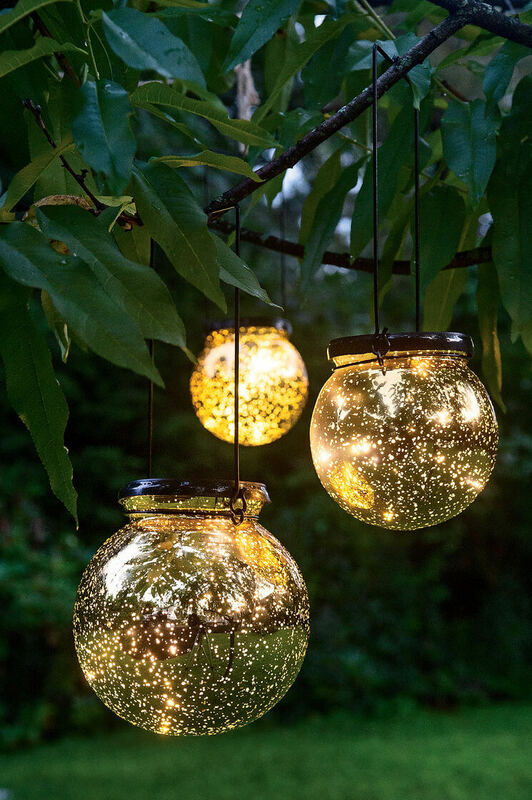 Lighted glass globes can make your yard feel like a magical place. They create bright night time whimsy and double as beautiful glass garden sculptures during the day. Opt for solar powered lighting to avoid chords and switches; these globes are most enjoyable when they turn on automatically at dusk. This dish planter is perfect for shallow-rooted succulents and an ideal way to bring bohemian charm to your patio. The unusual shape combined with illustrious succulents makes for a more creative aesthetic than traditional planters. Want to think outside of the plant box? This hovering dish would make a marvelous bird bath or feeder. Add an artistic touch to your outdoor space with a beautiful sculpture that doubles as a wind chime. This chime features two sizes of glass globes wrapped in copper with little bells that jingle softly. 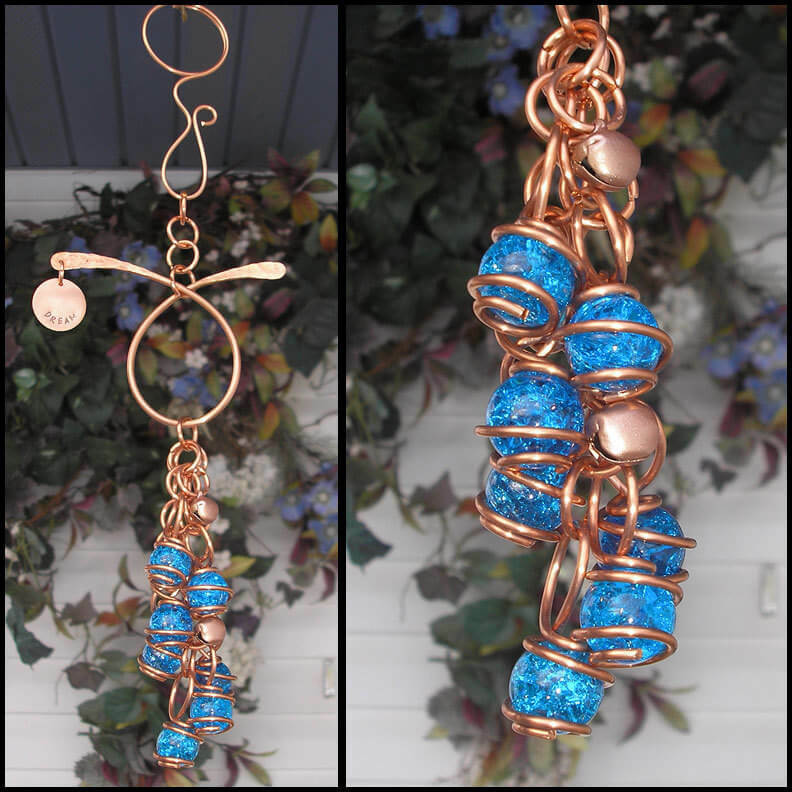 The large copper hook makes for endless placement options; this chime could hang from a tree branch, a rooftop ledge, or a tall shepherd hook. This suspended, salvaged ladder wrapped with Edison-style lights is the country version of a crystal chandelier. It would look great on its own above an outdoor table or could be decorated with flowers or garland for seasonal parties. This rustic piece is a sure conversation starter for any alfresco social gathering.